I personally need another fun nail art and I thought of doing a design inspired by the most famous mouse in the world! This is a Mickey Mouse nail art design. I also painted Minnie Mouse. I know how it feels to be lonely and I just don't have the heart to paint Mickey without Minnie. Initially, I was planning to use only black and white colors for this nail design. But I figured that would be sad to look at given my current disposition. Sigh. And so I decided to make it more colorful by playing with the cartoon characters' usual colors. OPI The "It" Color to represent their yellow shoes. Sally Hansen Cherry Red for Mickey's red shorts and Minnie's red dress. Orly Liquid Vinyl for their black bodies. Essie Marshmallow as base for their faces. Zoya Buffy for Mickey's and Minnie's faces. All colors were applied in 2 coats. For Mickey's and Minnie's faces, I used acrylic paint. I have 2 accent nails for this Mickey Mouse nail art design. For a change, I painted Mickey and Minnie on my pointer fingers instead of painting on my ring fingers that I normally use for accents. And since Minnie would be harder to paint because of her large bow on her head, I decided to draw her on my left hand. I added polka dots on my left index fingernail to represent Minnie's dress that matched her ribbon. I painted Mickey's face on my right hand. I added 2 buttons on my right ring finger to represent Mickey Mouse's shorts. Looking at it right now, I think it would be better if the buttons were bigger. Would you say so too? I wish I was into nail art the day I visited Disneyland. It would have been really nice to have a Disney inspired nail design as I explored the happiest place on Earth. I would have probably painted Mickey's friends on my other nails. Have you visited Disneyland? Where you wearing Mickey Mouse or your favorite Disney character nail design? This mani is fabulous!!! I absolutely love it. I might have to copy it sometime... :P This post totally made my day! I am a Disneyland nut.. I talk about it all the time & I think it really is the happiest place on earth. Just today my friend gave me two Disney shirts! One with Mickey and Minnie and one with just Minnie. I've been to Disneyland 4 times, most recently last July. I had planned on doing a Disney mani but I was too busy to do one before I left ]: Next time though!!!! these are so cute!! Ive only been to the one in hong kong but they are kinda small. Do you mind doing a black and white mickey as well?? Thank! Cute mani! 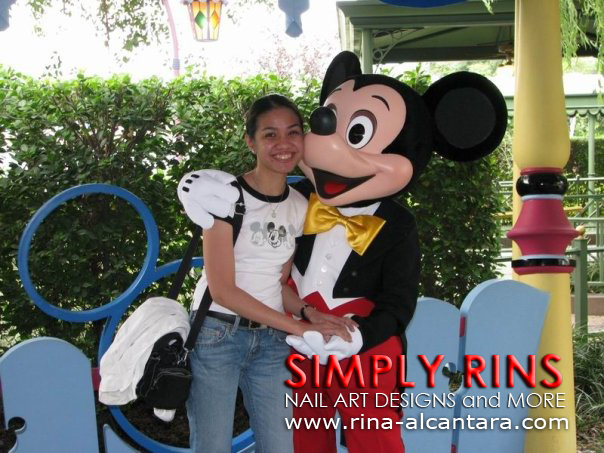 I love Minnie Mouse :) You got talent, Rins! Super cute! I love the accents and the whole mani! That is awesome! My niece would love it; she's all about Mickey & Minnie. Oh my goodness--this is such a great mani, and so neatly done! Beautiful nail-art!! I'm lucky to live 1h30 away from Disneyland Paris with the train so I have a yearly pass and go there quite often, usually sporting Disney nail decal on fingers and/or toes (because I'm useless when it comes to nail art :p), it's really fun!! Bravo again for your creation, it's amazing! This desing is sooo cute! I've made it yesterday and got to say that everybody loved it! Keep going with this nice work! May I suggest a new desing? maybe a Snow White theme? These are adorable! I love all things Disney, and would you maybe consider doing Winnie the Pooh nails? I think they would be so cute!